Ionic bonding is the process by which an electronegative atom strips a non-electronegative atom of an electron(s). The electronegative atom then becomes negatively charged and vice versa for the non-electronegative atom. Due to the strong polarity that exists in the newly formed molecule, it will tend to form crystal lattices where the negatively charged atoms are surrounded by the positive ends of the same molecules. There is a trend in the periodic table regarding strength of the ionic bond and the location of the elements on the periodic table. The ionic strength trend is related to the ionic radius trend. The closer the two nuclei are to each other, the stronger the bond between the two ions. For example, the bond between a sodium ion and a fluorine ion will be much stronger than a bond between a rubidium ion and an iodine ion. This is because the closer the positive charge from the nucleus of one ion is to the negative charge of the electron cloud of another ion, the greater the electrostatic force between the two ions will be. 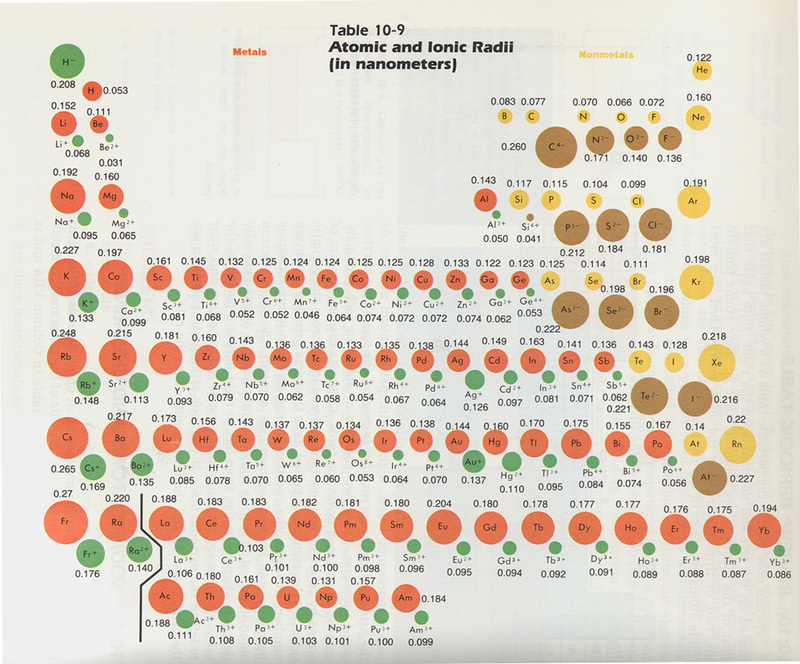 The ionic radius trend across the periodic table. This is related to the strength of the ionic bond. The larger the radius, the weaker the bond. Generally, the ionic radii of atoms is seen to decrease from left to right in a period.